Where to find Saint Donat hotels near an airport? Where can I find hotels in Saint Donat that are near tourist attractions? 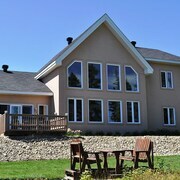 Planning to spend some time in Lanaudiere - Laurentides and want to stay in central Saint Donat? Saint Donat offers 5 quality hotels and apartments, all within 0.1 kilometres (0.1 miles) of its central area. 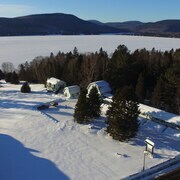 Travelers seeking a hotel close to the center of Saint Donat, can choose from the Auberge PrÃ¨s du Lac and Motel Le Fleuron. 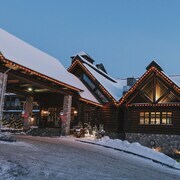 The Auberge de La Tour du Lac is 30 kilometres (19 miles) from the middle of Saint Donat. Or, alternatively, the Auberge du Vieux Foyer is situated 30 kilometres (19 miles) away. Two other places to stay include the Gite du Grand Peintre Gordon Harrison and the RCNT Chalets. Time permitting, you should travel to other places in the Lanaudiere - Laurentides region. Lanaudiere - Laurentides has beaches and forests, and common Lanaudiere - Laurentides sights include old towns, historic bridges and churches. Common pastimes in this part of Canada include snowboarding and skiing. 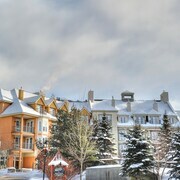 Mont-Tremblant is 35 kilometres (22 miles) to the southwest of Saint Donat, and is home to the Mont-Tremblant Ski Resort and the Casino Mont Tremblant. 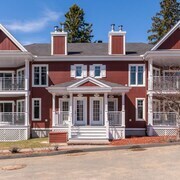 The Les Manoirs - Tremblant Sunstar and HÃ´tel Quintessence are a few of the Expedia-listed accommodation alternatives in Mont-Tremblant. 40 kilometres (25 miles) to the south of Saint Donat is Sainte-Adele, which is home to the HÃ´tel Spa ChÃ¢teau Sainte-AdÃ¨le and HÃ´tel Spa Excelsior. Should you choose to stay in Sainte-Adele, set aside some time to check out Village du Pere Noel and Glissades des Pays d'en Haut. Before you say goodbye to Lanaudiere - Laurentides, ensure you experience a local game. Visit Arena Lucerne, located southeast of Saint Donat. Sleep right near the action at the Le St-Martin Hotel & Suites Laval or the Sheraton Laval Hotel. 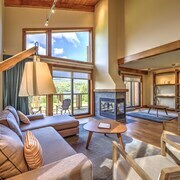 Now you've learnt a little about hotels and apartments options in Saint Donat, take the time to visit Expedia's Saint Donat travel guide for the low-down on cultural and scenic attractions in this area. What are the most popular Saint Donat hotels? Are there hotels in other cities near Saint Donat? 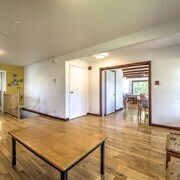 What other types of accommodations are available in Saint Donat? Explore Saint Donat with Expedia.ca’s Travel Guides to find the best flights, cars, holiday packages and more!